With over 30 years of repair experience, Big Mike’s Fiberglass provides professional work you can trust. Located in Pensacola, Florida, we are licensed to work at Pelican’s Perch or Harbor View Marina on Bayou Chico in Pensacola. We perform fiberglass and gel coat restoration and repair from the smallest scratch all the way up to major structural damage, as well as paint boats, anti-foul the bottoms and custom work such as customizing an old dash to incorporate new electronics. In addition to performing detail work like wet sand, buff and wax, we also restore boats such as the Mako and Boston Whalers which are pictured in our photo gallery. At our Pelican’s Perch Marina shop (40 Audusson Ave, on Bayou Chico – 850-453-3471), we’re able to work on larger boats and have the ability to lift boats up to 36 feet in length. Over 30 years of experience. No job too small or too big. Trailable boats as well as water based. Structural damage repairs as well as gel coat and cosmetic repairs. Shop is located inside the gates at Harbor View Marina on Bayou Chico. Pull boats up to 36 feet and set on racks at one of the local shipyards. Excellent references available upon request. If your boat is in need of repair, don’t despair! Call Big Mike’s Fiberglass today for repair! My bro, Big Mike, will take excellent care of you and your boat! 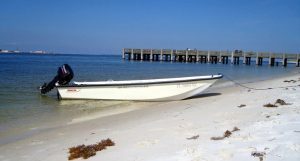 Trusted in the FL panhandle for years by boat owners- from dingies to yachts! Covering Escambia and Santa Rosa counties.